Red yeast is used in Chinese food to give some dishes their vibrant reddish-orange color. The yeast, called Xuezhikang, holds many health benefits, particularly for the heart. Red yeast can help to lower cholesterol, reduce your risk of a heart attack and greatly lower the need for bypass surgery. In fact, red yeast contains monacolins, the same substances that are found in prescription medications used to treat high cholesterol. While many Chinese dishes contain fried meats and grains, a great number of dishes are comprised of steamed rice and vegetables. Steaming food is one of the healthiest methods of preparation as it uses no oil and keeps most of the nutrients in the food intact. 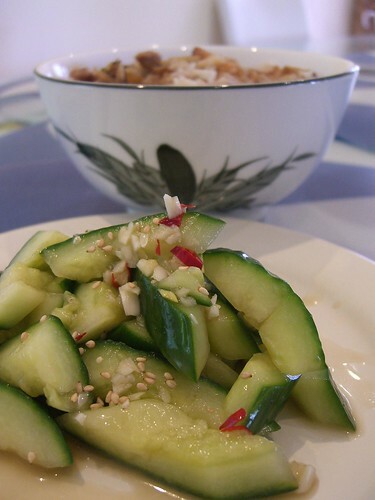 Instead of choosing Lo Mein or Pork Fried Rice, opt for a healthy pint of steamed Chinese Vegetables with brown rice. Green tea is quickly becoming the drink of choice thanks to aggressive advertising. The Chinese haven’t had to rely on advertising because they’ve known for centuries that green tea held tremendous health benefits. Green tea can help reduce the risk of esophageal cancer, lowers cholesterol levels and improves the ratio of HDL cholesterol to LDL cholesterol. Drinking green tea can also be beneficial to those people suffering with rheumatoid arthritis and cardiovascular disease. It’s a rare Chinese dish that is comprised solely of meat or animal products. Chinese food is typically not made with milk, cream, butter or cheese, all of which are high in fat and calories. Dishes that contain meat also contain a high proportion of grains and vegetables. Chinese dishes are normally incredibly well-balances, providing diners with healthy nutrients while avoiding high levels of animal fat which can put people at risk for heart disease and stroke. Many Chinese dishes are made with soy, normally in the form of tofu. Women who consume fair amounts of soy are at a lower risk for developing osteoporosis and find that their menopausal symptoms are reduced. Consumption of soy can also reduce the risk of breast and uterine cancers among the female population. While the jury is still out on exactly how much soy is beneficial and how much is too much, soy consumed in moderation has proven health benefits. The next time you pick up the phone to order your dinner, make a call to your local Chinese restaurant. Choose steamed vegetables, brown rice and soy based dishes when placing your order. By making smart choices, you’ll not only have a fantastic meal to enjoy but you’ll give your overall health a boost as well. Julia Freeman writes occasionally for delivery.com a site, she uses to find local Delivery Chinese Food services using their Delivery New York directory.